KROHNE Marine develop and manufactures reliable process automation and measuring instrumentation for marine environments. KROHNE Marine knows what it takes to deliver high-quality products to demanding ship operators and yards anywhere in the world. An exclusive network of sales representatives and service agents represent KROHNE Marine in all the main global shipping hubs and shipbuilding countries. The CARGOMASTER® system offers tank monitoring and alerts. It sends readings from all tanks and lines on-board to leading-edge, user-friendly software and runs on all standard marine computers. Combined with the high-precision cargo-level radar OPTIWAVE 8300 C Marine, CARGOMASTER offers unique benefits for tanker operators. The delivery of a CARGOMASTER system includes software adapted to your individual vessel’s applications, engineering, drawings, documentation and commissioning. In addition to tank monitoring, the system may include the observation of pumps and cargo lines, and integration with other systems on-board. CARGOMASTER is installed on all kinds of vessels, from the smallest product tankers to the most complex chemical tankers and very large crude carriers (VLCCs). The signal control unit (SCU) handles all sensor signals, as well as communication to other systems, including the CARGOMASTER computer unit. The cabinet is normally placed in the cargo control room (CCR), or an adjacent room for easy cabling and access. The SCU contains terminal blocks for deck cabling, interface modules and zener barriers for intrinsic safety. The CARGOMASTER Computer Unit (CCU) is an International Association of Classification Societies Ltd (IACS) approved Microsoft Windows computer. The CARGOMASTER monitoring and alarm software is an easy to use and powerful tool to obtain a full picture of tank contents and liquid cargo operations. The uninterrupted power supply (UPS) ensures that the system will run for at least 30 minutes after a total loss of power in the ship. With the selectable screen setup feature, the operator may choose to show only the tanks of interest (manually or automatically), leaving unwanted information in the background. Should something unexpected happen, automatic warnings appear and alarms will sound. With extensive functions for reporting, you can make printouts covering your needs. Based on MS Windows, which is well-known by people on-board, potential service and maintenance can be performed by crew members. With experts online, a problem can be corrected quickly and easily, saving time and money. The CARGOMASTER software has been approved and is certified for on-board use by all major classification societies. The CARGOMASTER system can be set-up in multiple configurations for full distribution of information. Doubling the amount of computers in CCRs will also give a better overview of operations. CARGOMASTER interfaces with several other systems, such as the ship’s automation, vessel management and loading calculator. Subsystems may be integrated to provide a full overview to the operator. EcoMATE® is a reliable system for the monitoring of bunkering operations and fuel consumption. Together with the OPTIMASS series of flowmeters, it offers accurate and maintenance free solutions for all kinds of application, from small and simple to large and comprehensive. EcoMATE allows for accurate measurements and monitoring of fuel consumption. The system monitors and stores detailed information about fuel usage and generates reports that enables a detailed overview. Benchmarking based on emissions may be part of the future for charterers choosing shipping companies. The EcoMATE is designed to fulfil requirements from the International Maritime Organization (IMO), and other authorities. Fuel oil expenses represent the biggest share of a vessel’s total operating cost. To be able to verify the amount of fuel oil delivered during a bunkering operation, you need accurate and reliable measurements. The EcoMATE system measures the flow of your bunkering line. Tailored bunker reports verify the quantity and quality, ensuring you receive every drop of your valuable ordered fuel. Bunker quantities measured by volume are dependent on temperature, density and possible contents of air. The EcoMATE system utilises Coriolis mass flowmeters, offering continuous monitoring of mass flow rate, density and temperature throughout the entire bunkering operation. 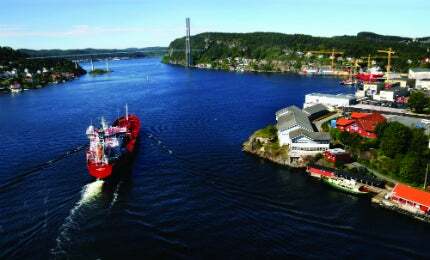 Based in Norway, KROHNE Marine handles all marine-related activities within the KROHNE Group. This includes sales and marketing, engineering and system design, research and development, after sales, service, and spare parts. The highly knowledgeable team is always up to date with the newest technology and sailing installations.